Still in need of a Valentine's Day surprise or just another fancy way to wrap that present? Then keep on reading as I might have something for you. 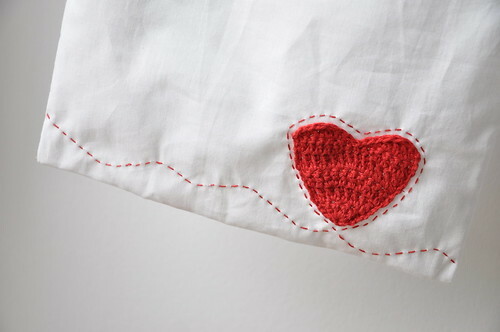 I still had a crocheted heart left I wanted to use. 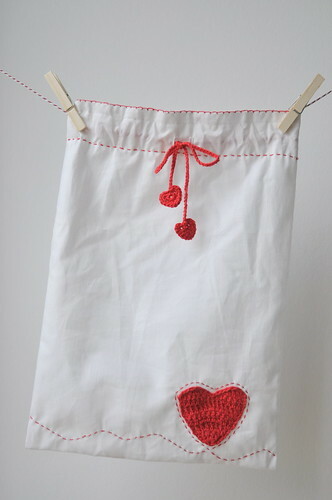 I decided to make a little drawstring bag - very simple with a couple of details added to give it a sweet little touch. This what it ended up looking like. The good news is - if you like this little bag, that is - that I have some instructions ready for you, so you can make one of your own. 1. Cut a rectangular piece of fabric corresponding to the size you want the bag to be (don't forget to add seam allowances on the sides and at the top). Cut the fabric such that you'll have the fold of the fabric at the bottom of the bag - I used a 35cm by 90cm piece. 2. Position and pin the heart, for which you can find the instructions here, onto the front of the bag. Stitch into place either by hand or with the sewing machine. 3. Close the side seams using the French seam as explained here. Note: close the side seams all the way up to the top. 3. Button holes for the drawstring: at the front of the bag, mark where the two button holes will come (you'll need two, 1cm high and about 1cm from either side of the center and 7cm from the top). Make the button holes with the sewing machine and cut open. Here's an "astuce" - a hint - for cutting open button holes. 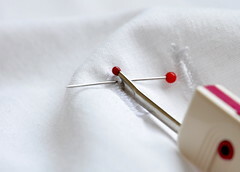 If you put a pin at the other inner end of the button hole that pin will keep you from cutting too far and hence cutting the stitches as well. 4. Fold the fabric over, on the wrong side, to make a tunnel of about 2.5 cm wide for the drawstring (the button holes nicely centered in the middle of the tunnel) and sew on the machine. 5. 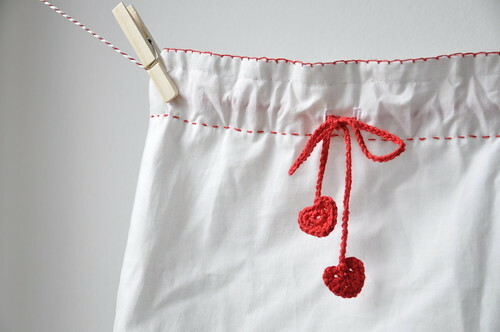 With the red yarn, crochet a drawstring in chain stitch. Put a safety pin through one end and pull the drawstring through the tunnel. 6. Crochet two tiny hearts (found through Whip Up here) and attach to each end of the drawstring. 7. Now you can further decorate the bag with some embroidery. You might prefer to do this before you start sewing, but I prefer to do this in the end because it's easier for me to visualize the end result.